Indian Army has released notification for enrolment on 10+2 Technical Entry Scheme Course – 40 commencing from Jan 2019. Applications are invited from unmarried Male candidates who have passed 10+2 exam with Physics, Chemistry and Mathematics. Age Limit : 16.5 to 19.5 years as on 01 Jan 2018. The candidates will be given a stipend of Rs. 8785/- per week during training. Regular officer pay after commission. Candidates will be selected by SSB. Duration of SSB interviews is five days excluding day of arrival. 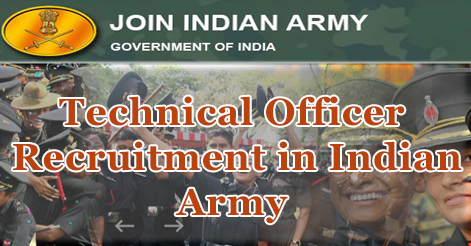 Candidates are required to send application online through the official website www.joinindianarmy.nic.in. No other mode of application is acceptable. The submission of online application will be accepted till 14 June 2018. Help us to improve this article/job posting "Indian Army 10+2 TES Course-40". We would be glad if you can comment below and provide your valuable suggestions and feedback. If this page have any wrong information/list or out of context content, then you can report us as well. sir my D.O.b is 03-jan-1998, apply kar skata hu kya? sir , i m currently pursuing my diploma civil engineering and i want to apply technical officer in indian army . so please tell me about this job . also my age is 20 , so is it right or not for this job …i m waiting for your response thankyou sir .